Chlorophyll is the most important constituent of plants. It allows plants to absorb light from the sun and convert it into energy. There are different types of chlorophyll; chlorophyll A being the most important. Chlorophyll is a liposoluble pigment that gives plants and algae their green color. 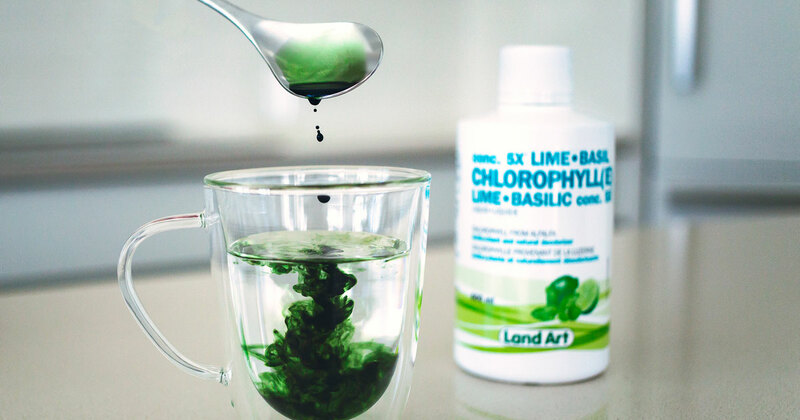 Chlorophyll, when in its natural liposoluble state, does not dilute in water and is minimally absorbed. This is why, for example, you can eat plenty of spinach without actually getting any of the benefits of chlorophyll. Sodium copper chlorophyllin is a derivative of chlorophyll. It is water soluble and bioavailable; assimilation is therefore highly improved. The antioxidant capacity of chlorophyllin is about 2000 times superior to blueberries and 20 times superior to resveratrol, an organic molecule known as one of the best tools to fight against oxidative damages induced by chemical carcinogens and radiation. Health Canada recognizes the antioxidant capacity of chlorophyll as well as its properties. It reduces bad breath and bodily odors due to perspiration, an undeniable advantage for active people. Simply add the liquid chlorophyll to fresh water. Benefit from its extraordinary virtues while adding some extra freshness to your water, if a flavored formula is chosen. For example, the mint flavor will add a pleasant sensation of freshness to your drink. Look for a reputable brand chlorophyll extracted from alfalfa for the best quality. Attention: a high-quality chlorophyll supplement should not contain preservatives. 1. Chlorophyll promotes the production of red blood cells. 2. It absorbs toxins – precursors to illness – that are in the intestines and the body. Chlorophyll is an ally of the Detox and Total Detox cures. 3. Chlorophyll acts as an internal deodorant: bad breath, sweat, stools, urine, food odors (such as garlic) and menstrual odors. The deodorant effect is also shown for people that have a colostomy. 4. Chlorophyll binds to aminos in the intestines. Cadaverine and putrescine, for example, are present in bad breath, urine, sperm and during bacterial vaginitis. 5. It isn’t a laxative, however, chlorophyll has a normalizing effect on the intestinal transit. 6. It has antioxidant capacities. These capacities are 1000 times superior to xanthins: caffeine, theophylline, theobromine, (tea, coffee, maté, chocolate). They are 20 times superior to those of resveratrol (blackberries, grapes, wine). 8. Chlorophyll increases the production of white blood cells, fighting against conditions such leukopenia. 9. The components are anti-inflammatory, it accelerates healing. The effects are anti-inflammatory and healing when applied directly to the wound. 10. It is a regulator of intestinal fermentation. Mycosis (Candida Albicans) is caused by antibiotics, hormones, corticosteroids, immunosuppressants and a high sugar diet. These infections are very resistant and difficult to treat. Chlorophyll reduces the production of gas and toxins that occur during digestion and contributes to protecting the liver, the second line of defense after the intestinal barrier. It is one of the best ways to continually detox the body. 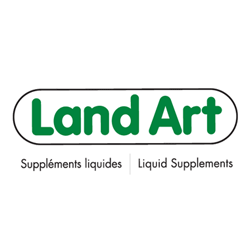 Pioneer in Canada in the production of liquid chlorophyll, Land Art offers different formulas in response to all of your needs. All of the Land Art Chlorophylls are created with high-quality chlorophyll, extracted with a supercritical process from non-GMO certified alfalfa. These products do not contain any preservatives and are gluten-free. Regular chlorophyll: this light concentration is ideal for initially starting to take chlorophyll. Offered in four delicate flavors (mint, apple, eucalyptus and lime-basil), it is also a favorite of children. Chlorophyll 5x: for those used to taking chlorophyll, this version contains 5 times more chlorophyll per 5 ml dose than the regular formula. 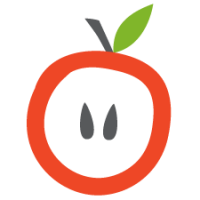 It is offered in 4 different versions: flavorless, apple, mint and lime-basil. Chlorophyll 15x: contains a therapeutic concentration of 150 mg per 2.5 ml dose, this formula is the most concentrated formula available. It is available with mint flavor or without flavor. Also, the powerful deodorizing properties of chlorophyll are teamed up with the virtues of essential oils in the ChlOralfa oral health products. Completely natural, this series has 2 mouthwash formulas and a breath-freshening mist. (1) Chemopreventive potential of chlorophyllin: a review of the mechanisms of action and molecular targets. Nagini S1, Palitti F, Natarajan AT.